With the Reds at home to Chelsea later on Sunday, City put pressure on their title rivals despite Fernandinho, who missed December’s loss to the Eagles, being absent with an injury that may rule him out of next week’s Champions League quarter-final second leg against Tottenham. City led in the 15th minute when Sterling found the top corner and he seemingly made sure of all three points after the interval by converting Leroy Sane’s driven cross, although Sergio Aguero going off with an apparent injury will have concerned Pep Guardiola. 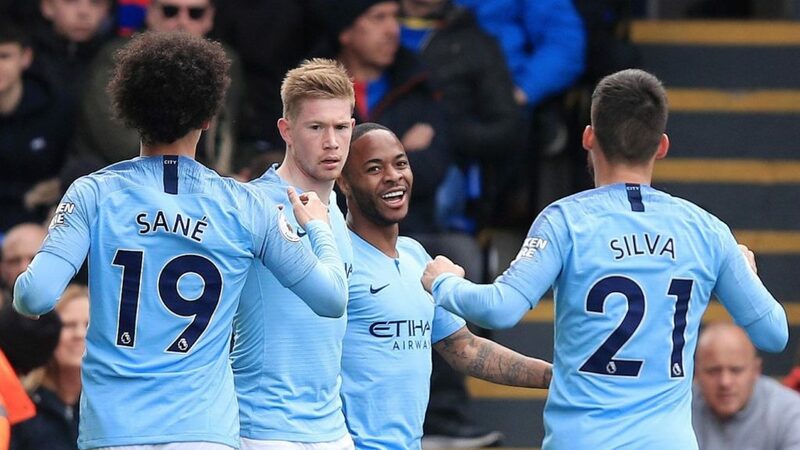 And the City boss was further frustrated as his side lost their clean sheet to Luka Milivojevic’s 81st-minute free-kick, although the defending champions were still able to close out another victory at Selhurst Park thanks to Gabriel Jesus’ precise finish. But the England forward was soon celebrating his 20th club goal of the season in all competitions, racing on to a perfect pass from the recalled Kevin De Bruyne to lift a fine finish into Vicente Guaita’s top-left corner, with the goalkeeper’s positioning questionable. Guaita saved from De Bruyne after Ilkay Gundogan’s chip into the Palace box caused chaos and Benjamin Mendy fired straight at the goalkeeper before the interval. Aguero’s substitution, the striker going down the tunnel after being replaced Jesus, could affect City’s chances of clinching a historic quadruple and they had to endure a nervy few minutes after Palace captain Milivojevic exploited a huge hole in the wall to beat Ederson. City have won nine in a row in the Premier League, keeping clean sheets in six of the most recent eight of those games, and the champions look in no mood to give Jurgen Klopp’s side an inch. It was a shock to see De Bruyne among the substitutes against Spurs in midweek, with Guardiola confirming the decision was tactical. But the Belgium playmaker, City’s star man last season, showed he can still play a central role in the quadruple chase with a high-class display. Not only did De Bruyne record his first assists of a Premier League season blighted by injury, he showed his undervalued physicality with important interventions in a scrappy midfield battle and his experience was crucial in closing out victory after Milivojevic’s late goal. And there were the usual signs of frustration from the attacker after he was – admittedly needlessly – tripped from behind by an unpunished De Bruyne just before half-time. City’s next two games are both at home to Tottenham, who visit on Wednesday for the second leg of the Champions League quarter-final and are back three days later in the Premier League. Palace are in action on Sunday, making the short trip across London to face Arsenal.